Ah Nora! Here I am wanting you to take on the deep waters of Islam and its position in the modern world, how Muslim societies can and must interact with the west – and here you are with a guide to Moroccan eating and hospitality! You are quite right of course… Eating with people they become companions – etymologically, people you share your bread with – and the divisions of culture, race, creed and dress become less relevant. I always liked the way Moroccans eat from one plate, sharing the best (the meat) out equally, or as equally as can be, at the end. Bon appetit, sahaa, enjoy your meal! Catherine, you obviously expect a lot from me, ha ha. One day perhaps I’ll be the ambassador you think me to be. Ah, memories. 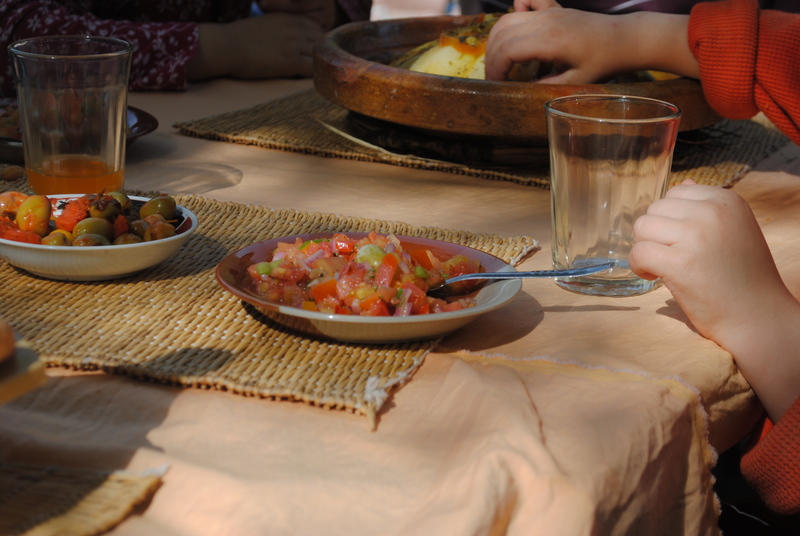 The first time my prim American mother visited Morocco and ate with my Moroccan in-laws she tried so hard to eat with her hands. She’d even practiced prior to going. But she just couldn’t do it. It was funny though. My ex-mil always provided her with silverware and even her own plate just in case. I love Moroccan greetings – all arabs, really. Salamu alaikum – wa alaikum salam – labas? – labas. – koolshee labas? – koolshee labas, al hamdulillah. – sehe labas? – sehe labas. – al hamdulillah. – al hamdulillah….and on…an on….and on. LOL! I like that most Moroccans are pretty flexible with their guests too, like your ex-mil. Sounds like you got the Moroccan greetings down. The more times you say labas, the more you care about the person. salam alaikoum sister, thanks for this useful guide which I can hand on to visitors now… but I really had to laugh about no.4 !!! remember the names.. oh my… all the abdullahs, mohammeds, aishas and fatimas… I love thes names but they all have the same… and still, after 8 years, it is difficult for me to remember who is who…mashaallah. Wa alaykoum salam Itto, glad you stopped by. I know everyone has the same name, but usually there is a nickname or second name, esp. with Mohammed. Is this true where you live? I sent you an email about the healing blog, hope you got it. Assalaamu alaikum Nora. I just love your blog, and Eid Mubarak. Insh’Allah, we will meet one day as I would love to spend more time in Marrakesh. Allahu Alam. In the meantime, keep up the good work. Much love and salaam from Hadia. Chokran for all the tips and advises!Alhamduliliah! Many thanks for this post, I learned a lot indeed! I’ve only recently found your blog. It’s very interesting to hear about your life! You might be pleased to hear it’s prompted me to put more research into finding a way to learn Arabic and for the first time, I managed to find a textbook with DVDs that go alongside it so that is definately on my shopping list for next month! Gemma, thanks for reading. It is appropriate to use the phrases even for non-Muslims, in fact I think it’s very respectful and shows that you’ve taken some trouble to learn some part of this culture. I am Moroccan but has lived most of my life outside Morocco. My husband is English and he has been reading your blog as well, very helpful. Thank you. Just found your blog and I love it! 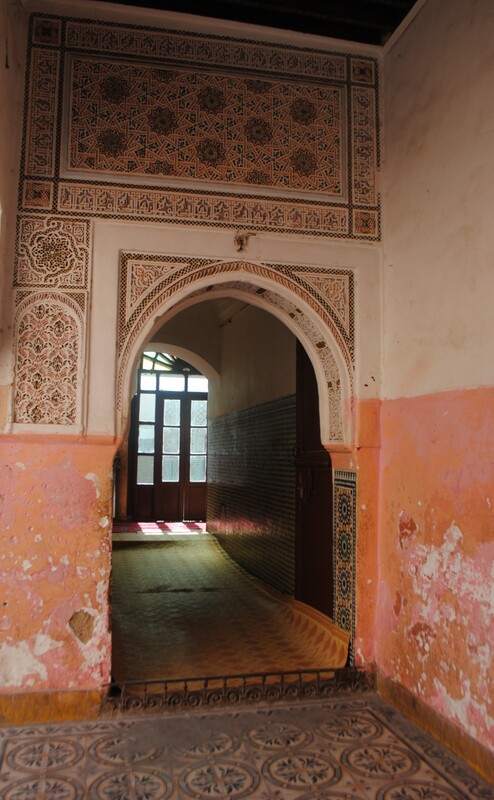 We are moving to Morocco soon insha’Allah, to El Jadida, and I’m from NM, so it’s very interesting to see familiar things gathered in one place here. Wow yeah I’ve blogged about both those places. NM is very dear to my heart. Which city are you from? I just love the sky and beauty there. May your move be a fruitful one insha Allah. Oh how I wish I would have read this before I came to Morocco! Great article! I think you’ve missed the right-hand, left-hand rule. Oh yeah, my son is a lefty so we are reminded constantly of that rule. This post was great, I was laughing all through it. Especially when I got to “Don’t wander”!!!! LOL that’s was awesome; the Don’t wander rule is the first rule one’s learn as a child when start eating with people….hahaha lot of memories. Just for the Rule of saying bismillah, alhamdulillah, isha’Allah and why not; don’t feel that you’re obliged to say it; eventhough it’s a great to do as for asking God’s blessings. I am planning my first trip to marrakech later this year and I am very excited about it. I have spent a lot of time over the years living and working in muslim countries, especially egypt and meal time etiquette sounds very similar although all dishes are put out at the same time and we always sat on the floor with a plastic coated tablecloth on the floor. It was typical for everyone to have a spoon to eat with, this was useful to eat soup and rice and it was also acceptable to use pieces of bread to dip into soup and into the sauce that the meat was cooked in or to make a piece of bread into a little scoop to pick up a piece of meat or vegetable. It was very important to only use the right hand to touch food and to eat with. If several people were eating together each course would be split into a few small bowls and spread around so that everyone could reach everything. This meant that you might only be sharing each bowl with one or two other people. One thing that is the same in all muslim countries are phrases which come from the koran such as bismillah, allhamdolellah, inshallah and so on. This should give me a headstart with getting by language wise in morrocco. Reblogged this on No More Couscous.